An Award For Billy's Pub. 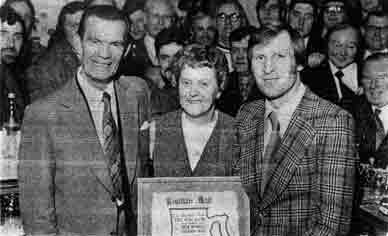 Celtic Footballer Billy McNeill's Halfway House Bar in Bellshill, Lanarkshire, has gained the Sunday Mail award as Pub of the Month. The newspaper says that it is neat and trim, homely, and that Billy's mother, Mrs Ellen McNeill, is mine host and takes time to chat with everyone. Another point in its favour, the Sunday Mail points out, is that there are not many pubs in Scotland that think about catering for the pensioners with such items as cheap beer. For them a pint of beer at Halfway House costs 11p.